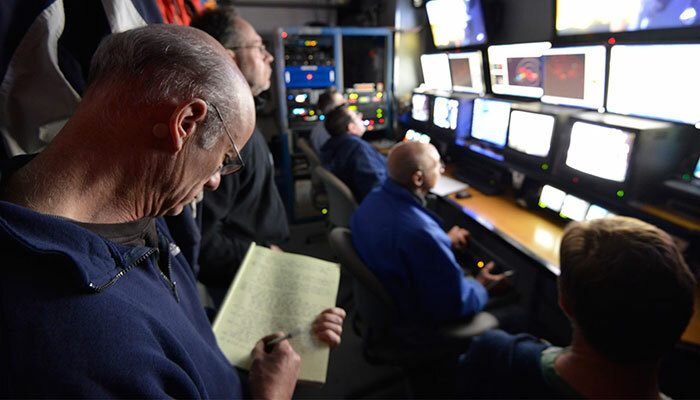 We’ll be following the next three science verification cruises beginning in early May. We arrived in San Francisco on November 7 to an unusual sight: clear skies, calm seas, and very little ship traffic. It was so calm, in fact, that I woke up in a panic thinking that I’d missed our passage through the Golden Gate and that we’d already docked. 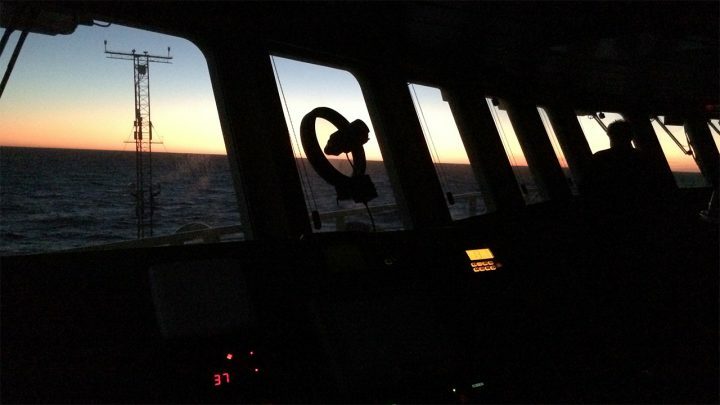 But when I checked my watch, it was 5:30 a.m. Sleep was going to be impossible with all the adrenaline still pumping through my veins, so I got dressed, skipped coffee in the mess, and went out on deck to watch the sun come up. Aside from sailing under one of the most iconic bridges in the world, the passage into San Francisco Harbor was uneventful. Memorable, stunning, and beautiful, but uneventful. We nudged up to the pier just south of the Bay Bridge, passed our lines to a few helping hands on shore, and suddenly the inaugural voyage of R/V Neil Armstrong was over. 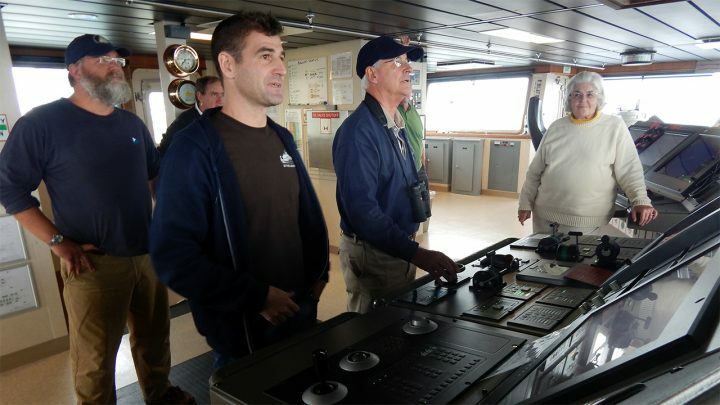 The rest of our time in San Francisco was occupied with either getting the ship ready to host a parade of guests or watching the faces of our guests beam as they looked out from the bridge over the waterfront or stood on deck and listened to the crew describe science at sea. 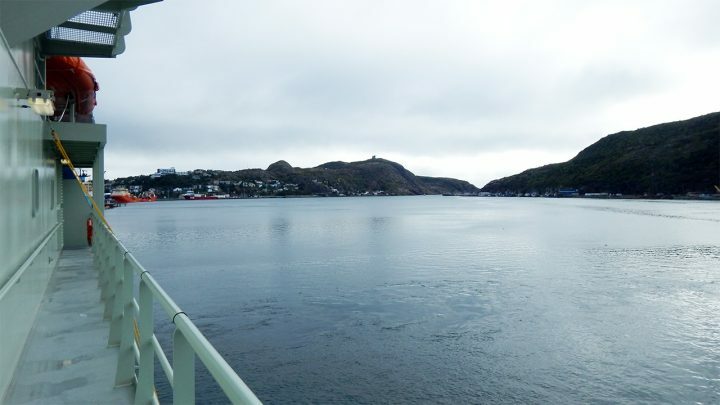 As commonplace and everyday that life aboard a ship can quickly become, all it takes is a handful of visitors to remind us that there really is something romantic and other worldly about a ship, especially a research vessel. Even if that ship is functional and business-like, as this one is, the Neil Armstrong radiates a sense that its job is special. Add that special name to the bow and put “R/V” in front of it and you can understand why four pilots came out to guide us in, why more then 100 people streamed up the gangplank on Sunday and a rainy Monday and left only grudgingly, and why watching the video of us steaming under that bridge still brings chills. 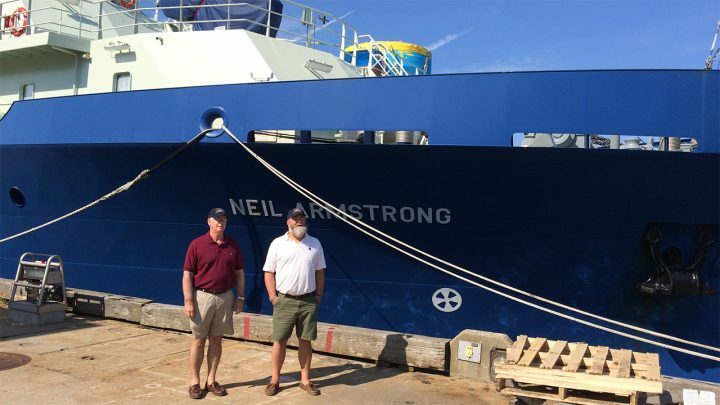 This weekend, the Neil Armstrong will be dropping anchor in the approach to the Panama Canal, where it will await a new group of visitors—and its turn to pass through to the Caribbean. 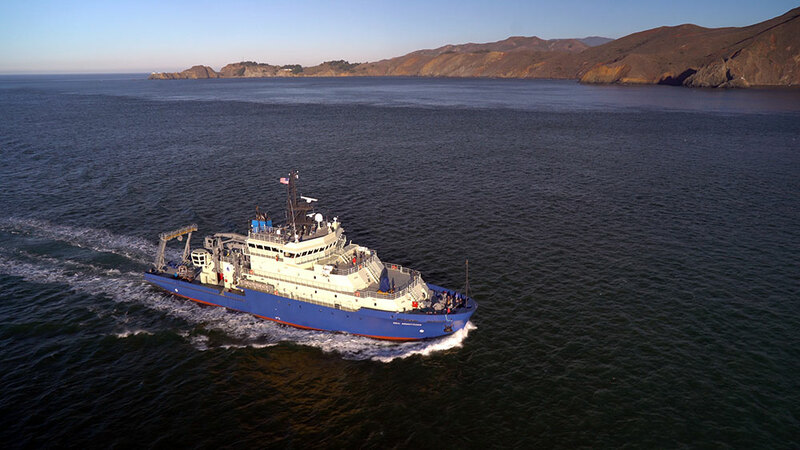 After that, it will turn north for Charleston, S.C., and another shipyard, where it will receive much of its science equipment and truly become a research ship. 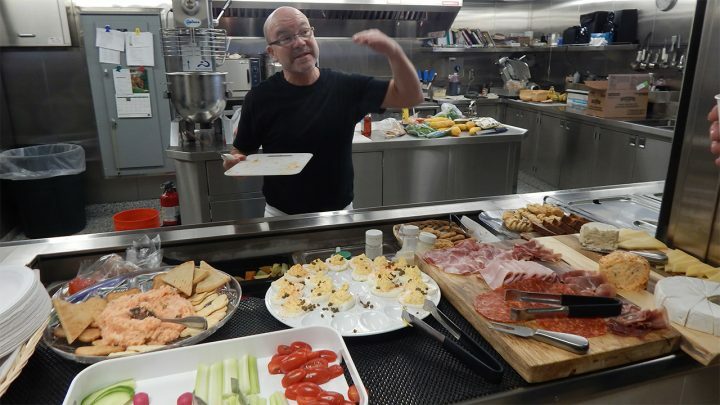 Our work with the cranes and winches and our time living on board also revealed some small changes that could help make the ship even more workable and livable. 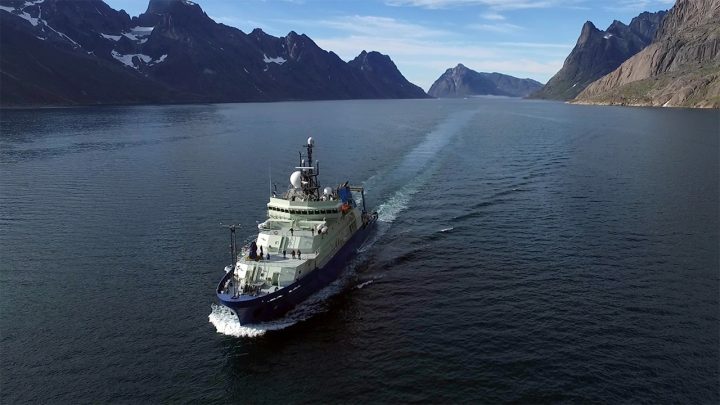 After shakedown cruises and tests of its new systems, Neil Armstrong will begin a series of science verification cruises in early March designed to assess the ship’s ability to support the full range of oceanographic work that will form its mission for decades to come. 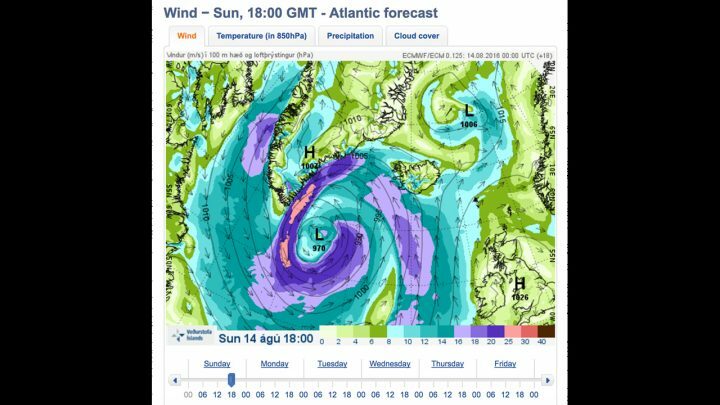 After that, or actually in the middle of all that, the ship will make its way north. 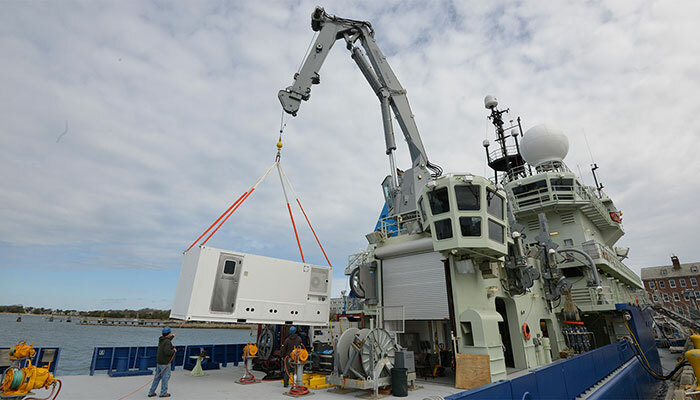 It’s not every day that an institution like WHOI gets to welcome the arrival of a new ship. 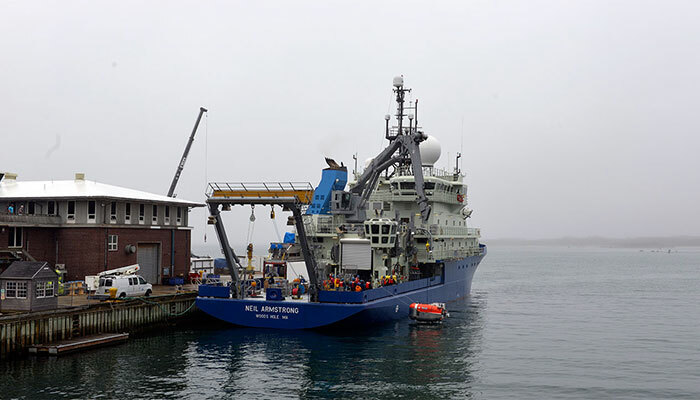 In fact, it’s quite rare, so it will almost certainly be an exciting time in Woods Hole when the ship rounds Naushon Island and makes its approach to the WHOI dock that first time. Probably even more exciting than the trip into San Francisco. 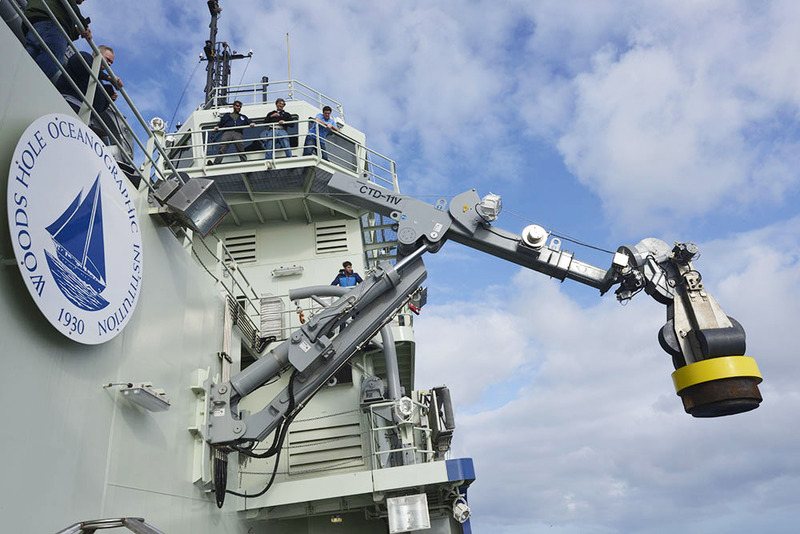 There are two things to know about winches, cranes, and wires: they are very complex and they are crucial to this ship (and to any oceanographic research vessel) accomplishing its mission. Day 3 of the transit to San Francisco began a series of tests that, if all goes well, should finish today and that constitute the main objective for this part of our trip. First, a bit of nomenclature. Any of the wires that have copper or optical fibers at their core, giving them the capability to transmit data and power are called cables; any of the wires that are merely braided strands of metal are called wires. For simplicity, I’ll use the word wire to mean either type. 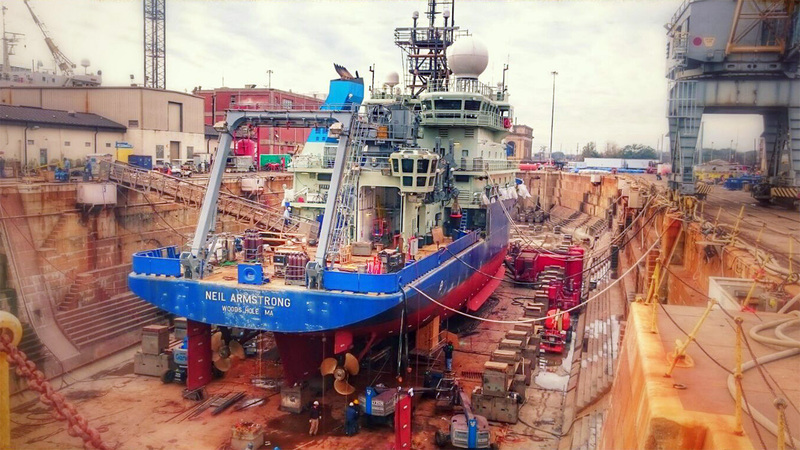 There are 10 kilometers (6 miles) of on each winch drum the Neil Armstrong. 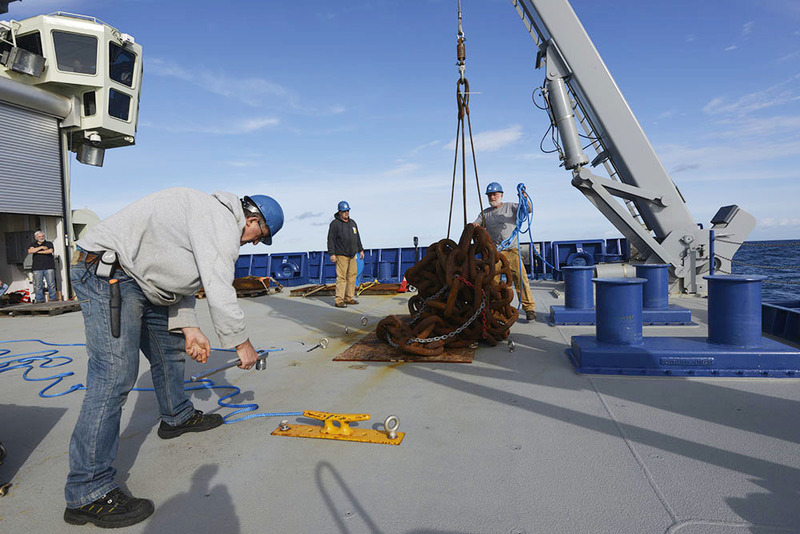 This is the first time the wires on each of the four winch drums has been run out, making it a crucial time in assessing the ship’s ability to support science. Two of the wires (one 3/8″ wire and one .322 cable) can be threaded onto each of two cranes on the starboard side. These are actually not cranes, but “knucklebooms” that unfold from the side of the ship like gray praying mantis arms to lower instruments into the water, ideally with minimal tending by deck crew. Just to add to the complexity of the operation, one of the winches is also able to compensate for the motion of the ship, so that anything hanging from it will remain relatively stationary in the water or can be brought up at a constant speed. 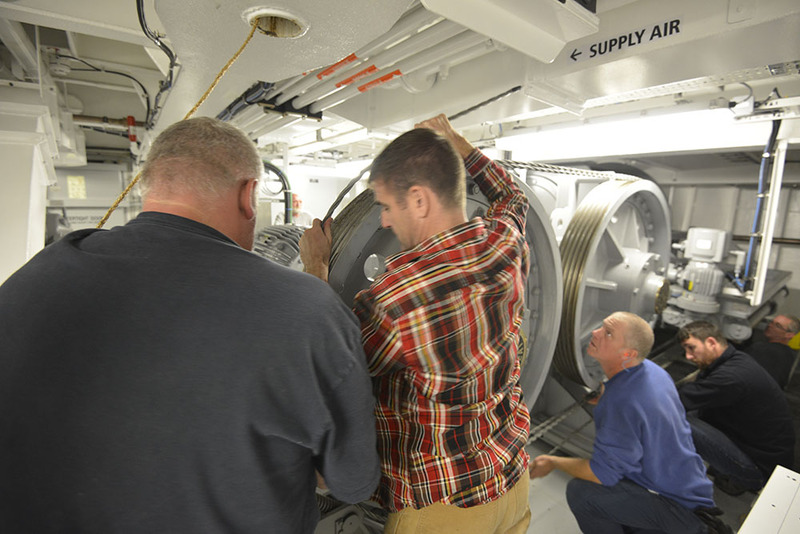 Under the rear deck of the ship, there is a large traction winch with two drums of wire (one 9/16″ wire, one .681 cable) that can be threaded up to the large A-frame on the stern. These are used for towing and lifting heavy loads, in the case of the 9/16″, or, with the .681 cable, to operate ROVs like Jason, by transmitting power, control signals, and even high-definition video along the length of the cable. The complexity comes in winding and unwinding these drums in a controlled manner and under heavy loads. There is a severe sort of beauty to the precision with which the winches were designed and built—in particular with which something called the level wind was built. 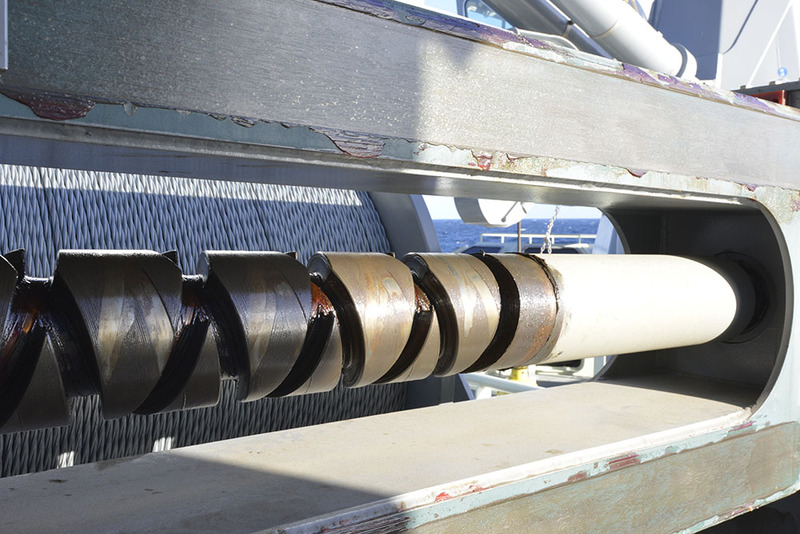 As the winch drum turns, the level wind places each strand of wire beside the one that came the turn before it and in between the two turns directly beneath it. Without the level wind, that ordered simplicity would be replaced by an over-wrap, or worse, a horrifying tangled mess called a wuzzle—something that can damage the wire by crimping or crushing it and that has been known to end a cruise prematurely. To do its job, the level wind has to account for the diameter and type of wire, the number of layers already on the drum and the number of turns on the current layer. These winches have a level wind that is both electronically and mechanically controlled. The software controlling the level wind is hidden from sight, but the mechanical part of the level wind, something called a diamond screw, is laid bare. It is a massive, precision-machined shaft that turns slowly with the drum to keep the winding head (and wire) in just the right position at all times. One tiny deviation forms the nucleus of a wuzzle. That’s the complex part. Now for the importance of these machines. Quite simply, we could not do ocean science without them. 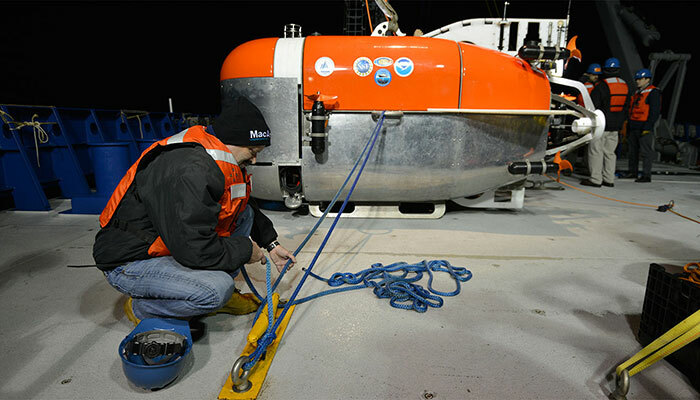 Any research ship can only move over the surface; we need other instruments to help us look into the depths. Some of those are (or soon will be) mounted to the bottom of the hull: sonars and current profilers and the like. 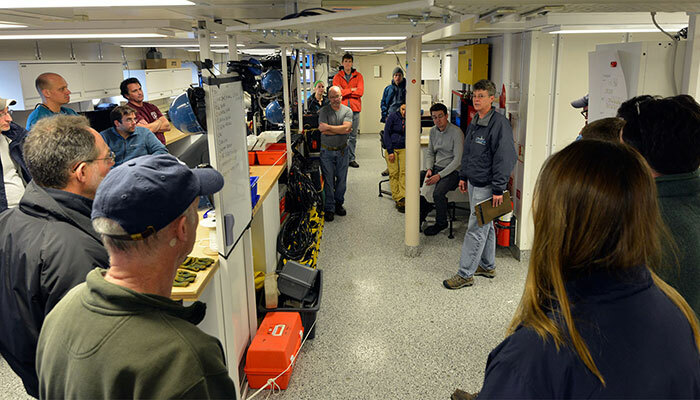 But many scientists come on board eager to put things in the water that take samples, gather data, or explore features like hydrothermal vents. For that, we need winches, cranes and wires (or cables). And we need them to be reliable, well maintained, and ready to work turn after turn and time after time. Hence the care with which these are being tested, observed, and assessed. 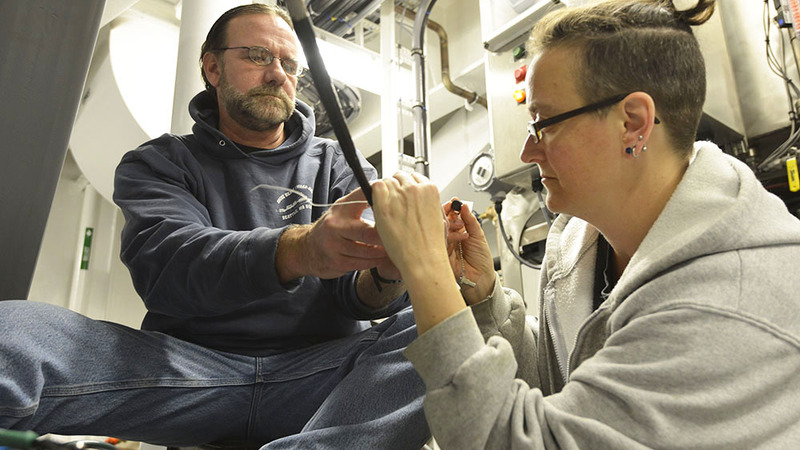 One of the most common instruments that will be going over the starboard side is the CTD (conductivity, temperature, depth) rosette, which measures those basic properties of the water and is equipped with two dozen 10-liter bottles that a technician can close from the surface to capture water sample at specific depths. 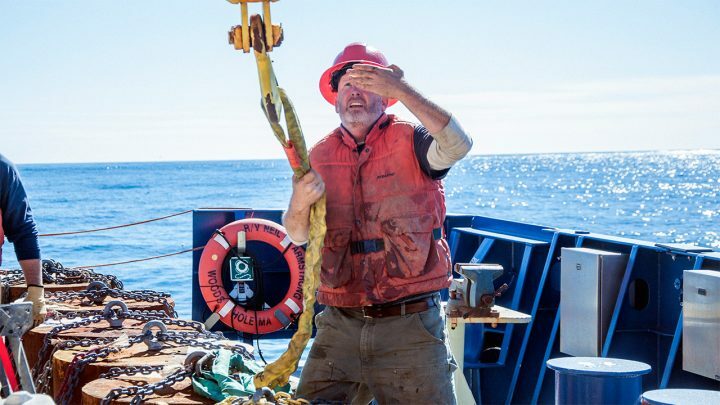 This is considered the bread-and-butter of ocean science. 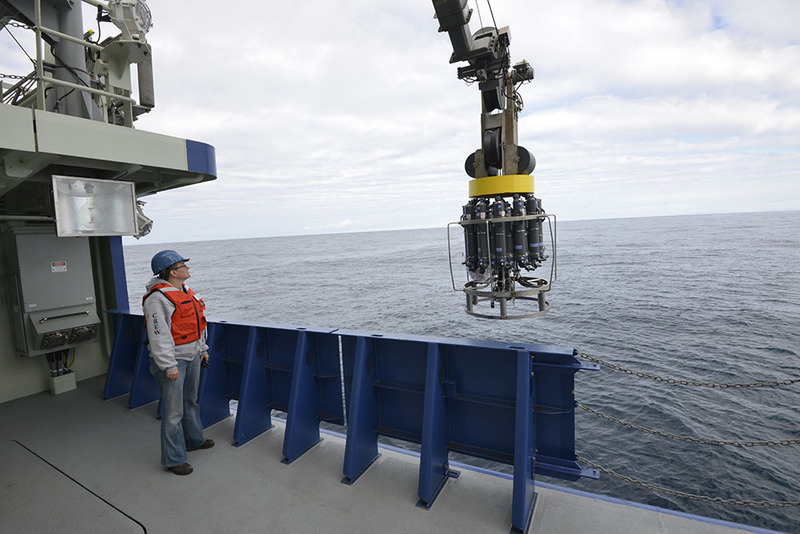 Today, in our last test, we lowered the CTD almost to the bottom, a little over 4000 meters (2.5 miles). It’s later now and the CTD is on deck. When it came to the surface, it attracted the attention of some passing dolphins. 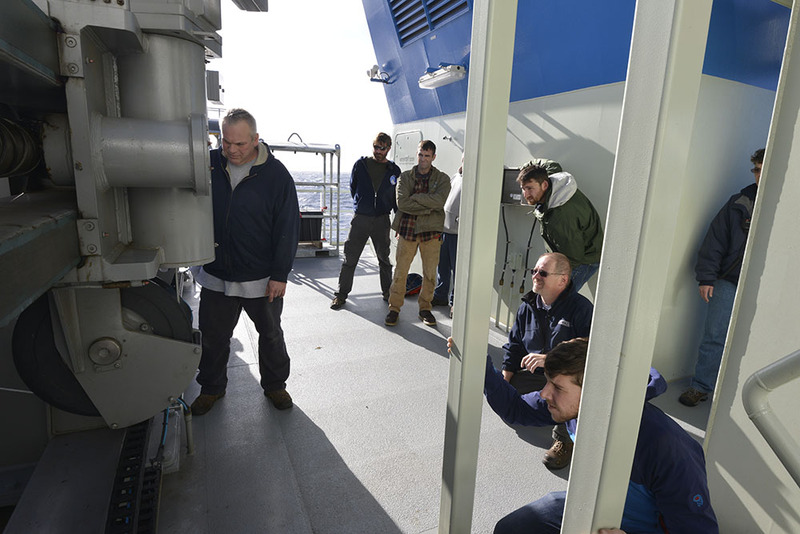 The technicians still have to look at the data and assess how well the winches operated and the crew has to discuss how to fine-tune their choreography on deck with the new cranes, but overall things went well. The cranes might be fancier and the wires and winches shiny and new, but this crew has worked with heavy machinery like this for years. Every cast brought a little more light to the question of how well the Neil Armstrong would be able to that most basic task of putting something over the side and bringing it back again. (The answer: It will do just fine.) 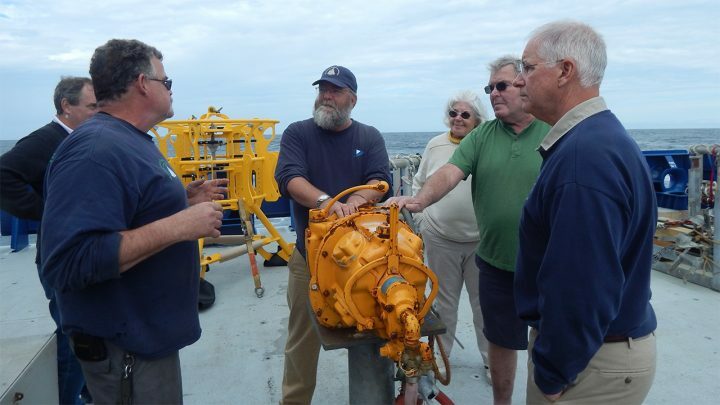 There are some changes that will need to be made in the upcoming yard period to accommodate different instrument packages, but with that final deployment today, carrying a CTD within a few dozen feet of the seafloor and back, Neil Armstrong made one thing clear. 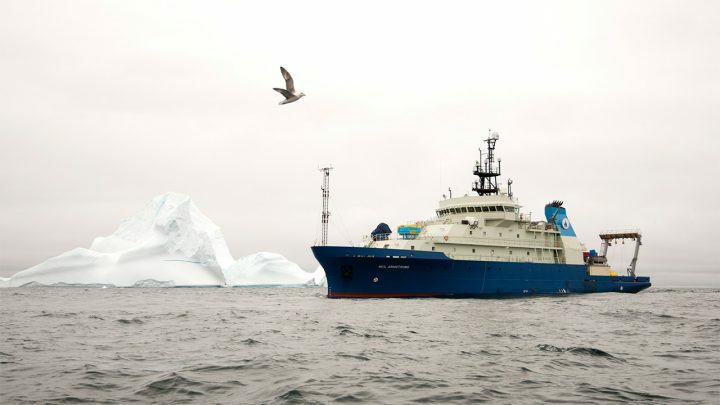 This is a research vessel and it is equipped to bring knowledge to the surface.